If you’ve been following any of DC’s recent shoe promo videos, you’ve probably come across the hilarious political Wes We Can marketing campaign featuring the new Wes Kremer 2 shoe. DC dropped the video in the skate scene right in the mix of the presidential debates happening in America, and produced the best video a company could do by tying in politicians and skateboarding footwear. With that said, the vibe of the video is exactly in tune with Wes Kremer himself, and his newest pro model, the Wes Kremer 2. The shoe is a low profile vulcanized model featuring a few elements of technology that really shine through the weartest period. In this case, the term quality over quanity applies to the fullest when describing the technology in this shoe, and the quality of this shoe is as impressive as Wes’ huge hardflip over the rail in the video. Del tha Funkee Homosapien puts it the best, “Wes is regulating big banks!”. Check out the review below to see how well the shoe stood up to our 10 hr weartest, and whether or not you should donate 75 dollars to your local skateshop to support the In Crust We Trust foundation! The DC Wes Kremer 2 runs a half size big. 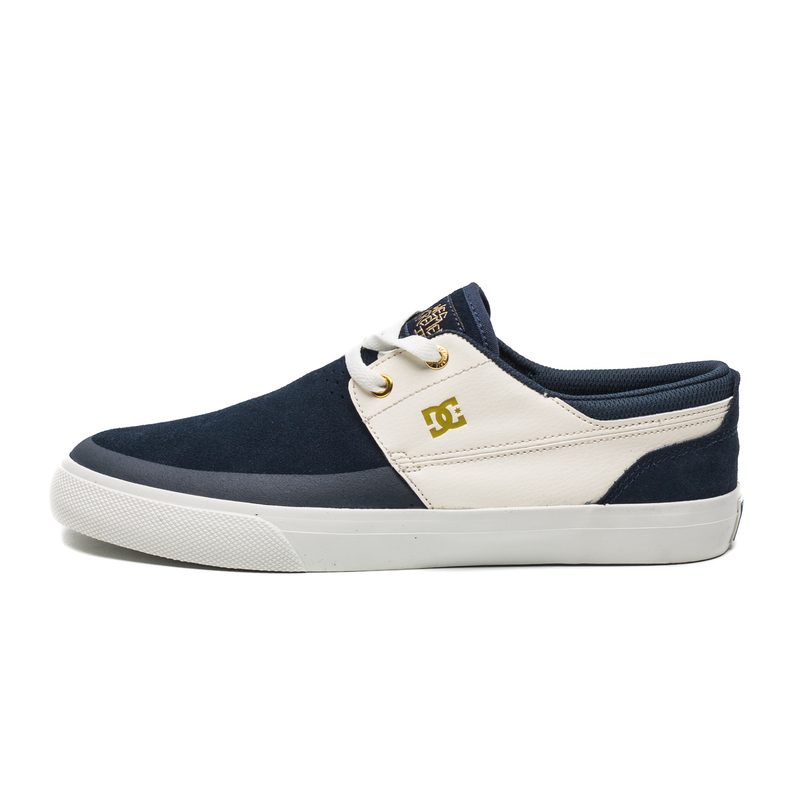 One of DC’s main focus on this shoe was to enhance it’s optimal durability. 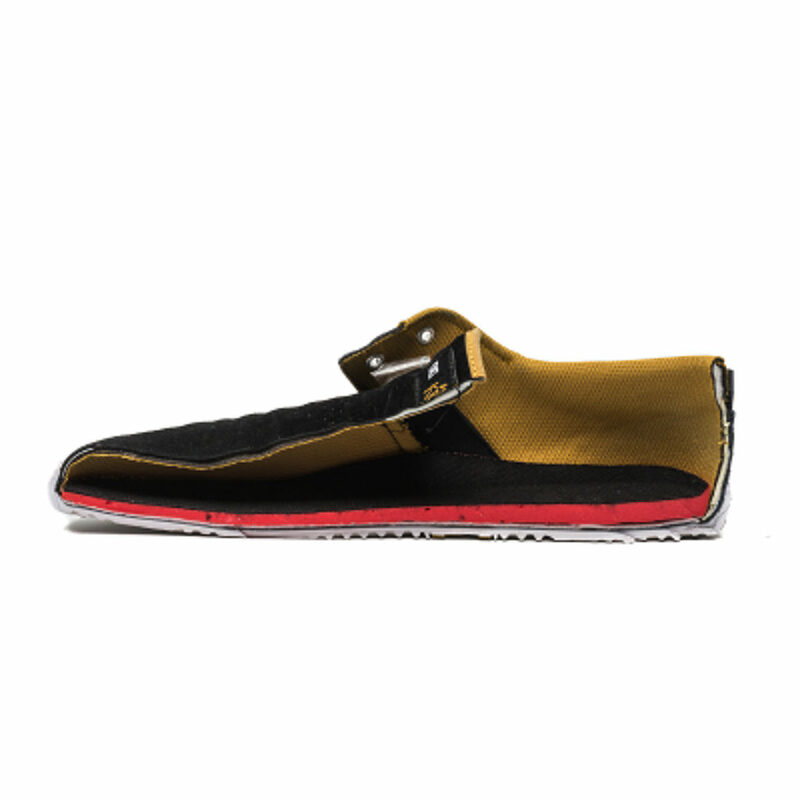 Although the profile of the shoe looks very simple, clean and almost like a slip-on, the shoe’s been adapted for weeks to months of skating. There’s two main technologies from DC that has contributed to the prolonged lifespan of the shoe, with the first being their Super Suede technology. As DC puts it, it’s a type of suede that has been enhanced to be 50% more durable than regular suede and retains the instant comfort and soft feel of regular suede. DC uses Super Suede in almost every one of their models, but in this case, the suede held up insanely well for over 10 hours of skating and proved to have zero ollie/kickflip holes. 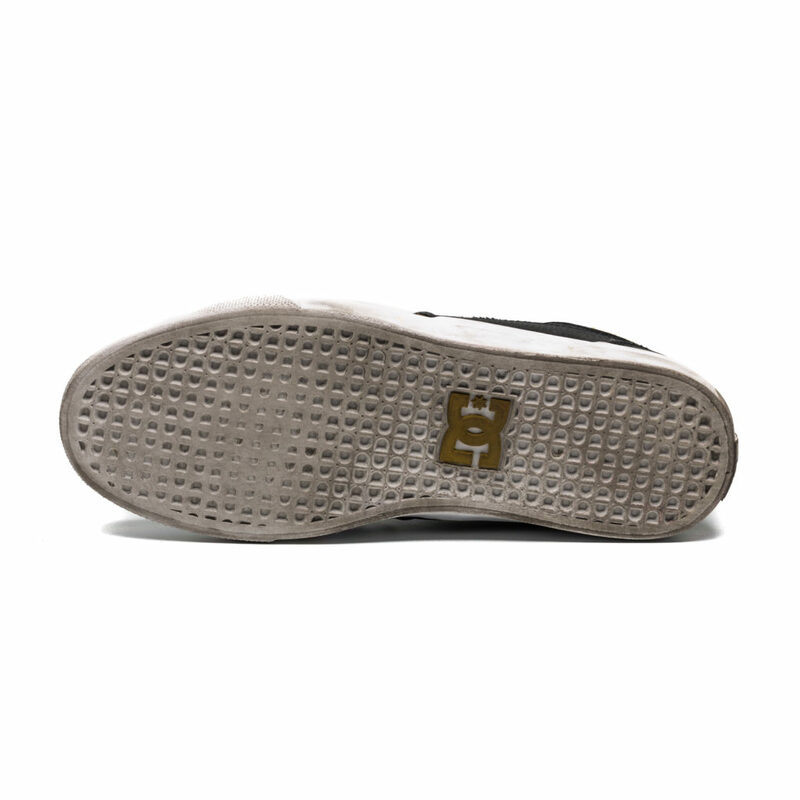 Another technology that enhanced the Super Suede was an added high abrasion screen print around the toe cap area to deter abrasion from griptape away from the Super Suede and instead towards the first layer of defense. This is also a similar technology used in the Nike SB Stefan Janoski Premium, which many have seen feature a rubber coated toe cap for durability. With that said, not only does high abrasion screen print look better on the Wes Kremer 2, but was extremely proactive in directing all abrasion towards that first layer of defense, and revealing an untouched layer of Super Suede beneath the print that extended a second life for the shoe. The durability of the vulc was impressive as well, normal abrasion marks were found but there were no tears or loose ends of the vulc as noticed in other skate shoes. DC has an extensive product line of shoes that feature cushioning technologies part of the Impact series. Nyjah Houston’s first model featured Impact-G, which focused around gel cushioning to prevent heel bruising, while Evan Smith’s Pro model featured Impact-I cushioning where the sole of the shoe featured cone shaped impressions to absorb and distribute impact from landings better. The Wes Kremer 2 however, shares the same Impact-S technology as its predecessor, which focuses on splitting the fore foot and heel area of the insole into two distinct zones of thickness to combat heel bruises and the pain that comes from forefoot strikes. During our weartest period, the cushioning of the DC Wes Kremer 2 was quite satisfactory for a low-top vulcanized model. The shoe itself wears and feels like a slip-on model, but the DC patented Impact S cushioning technology is what differentiates the Wes Kremer 2 from any other slip-on similarities. 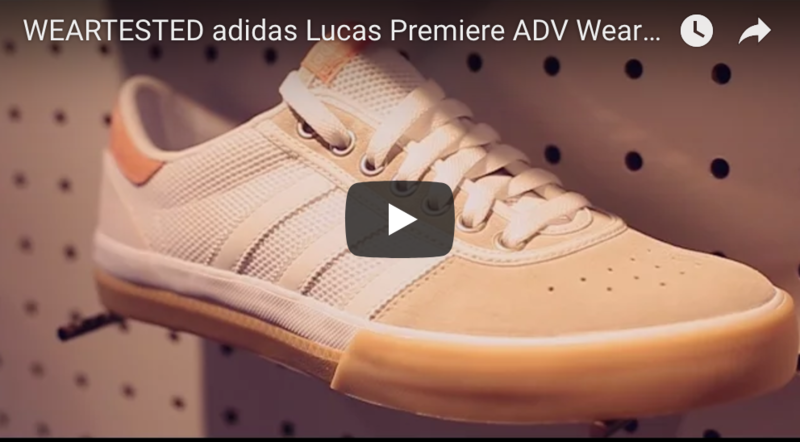 This shoe is absolutely well protected when it comes to low to medium impacts, but the shock from high impact landings can still be felt in the forefoot and heel. The shape of the Wes Kremer 2 is one of the highlights of the shoe. For those who like low top vulcanized models, or even skating in slip ons, this model is the perfect harmony between the two. The sidewalls of the shoe are pushed back along with the shoe’s eyelets, which creates a longer toebox, starting almost halfway through the shoe; this may take a while of getting used to for some. The two shoelace eyelets featured on the shoe also give a bit of a boat shoe resemblance. Moreover, although the shape of the shoe itself seems like a slim vulcanized model, it fits skaters with wider feet quite well. The boardfeel of the shoe was good; the Impact – S technology took into mind the boardfeel necessary in the front of the shoe, and limited the amount of cushioning in the forefoot area to provide better boardfeel. It was easy to feel out the concave of the board and set up for flip tricks more accordingly, as opposed to doing so while wearing other skate shoes that focus more on heavy cushioning from forefoot to heel. The vulc of the shoe was quite grippy at first, but after the 10 hr session, the abrasion from flip tricks and ollies smoothed out the diamond-patterned traction of the vulc and molded into one layer between vulc and super suede. This eventually affected the grippiness of the vulc, as with most shoes, but the super suede still held up and provided a different material for abrasion. The outsole of the shoe featured DC shoe’s classic pill pattern grip, which showed no blow-out spots during our 10 – hr test. The Wes Kremer 2 featues an elastic goring that connects the tounge to the sidewalls of the shoe, providing a locked in slip-on feeling. With the addition of two shoelace eyelets, the stability of the shoe is enhanced from slip-on to actual low top vulcanized model, and fits great while skating. The shoe was extremely comfortable to wear while skating, the only drawback of the shoe would be it’s breathability; apart from the couple of holes created for airflow where the end of the tounge meets the toebox, there was no additional feature to let heat escape, and as a result, the Super Suede absorbed moisture and became quite rippled during the 10 hrs of the weartest. With more skating, the suede would probably become more and more wavy, and affect the grip and durability of the shoe. Additionally, the shoe’s heel counter was quite secure, and provided a locked in support system for the heel to rest against. The DC Wes Kremer 2 is an extremely comfortable shoe that is the perfect harmony between a low top vulcanized model and a slip-on model. The shoe excels when it comes to durability, stability and boardfeel, but small tweaks to cushioning, breathability and grip can help enhance the performance of the shoe for the better.